Abstract. The paper shows the constituents and technical properties of low calcium aluminate cement concretes with ultradispersed mineral powders and different admixtures. In the heat treatment conditions the refractory low cement concretes easily develop the high mechanical strengths. This process is a result of the new mineralogical phases apparitions (i. e. mullite, anorthite), due to the reactions between concrete constituents, which have the role of stronger matrix – aggregate ceramic bond and a dense and hardened matrix genesis. But in case of the same type of concretes it is imperatively necessary the development of good strengths in the normal conditions hardening process, too.The advantages of using a judicious ratio of chemical bond, micronized powders as well as particular additive (like polymer) are underlined in order to emphasize their significance in the achievement of concretes having good mechanical properties in normal and heat hardening conditions. Abstract. The particle size and the morphology were investigated with a NanoR-Atomic Force Microscope by Pacific Nanotechnology (with X’Pert Software) operating at atmospheric pressure at vibrating mode. The samples analyzed were prepared by deposing a powder on a glass. It was shown that images of the surface morphology are closely connected with the relation between the magnitude of the metallic oxides (TiO2 or α-Fe2O3) nanoparticles grains and the geometrical size of the polymer molecules. The images of TSPP-Sil-TiO2 nanoparticles in acrylate matrix have been compared with TiO2 nanoparticles alone. The images of α-Fe2O3 nanoparticles in polypyrrole matrix have been compared with α-Fe2O3 nanoparticles alone. Abstract. Molecular materials are made from molecular units, separately synthesized and subsequently organized into some condensed phases. Because of their very nature, the electrical properties (ferro- and antifemlectricity, semiconductivity) and the optical properties (polarizability and hyperpolarizability) of the molecular materials may be deduced from the physicochemical characteristics of the isolated molecular units (symmetry, polarity, redox potentials, absorption spectrum). Octaalkyl-phthalocyanine derivatives lead to columnar and nematic lenticular mesophases. These liquid crystalline phases are shown to be usable in the domains of electronics, opto-electronics and iono-electronics. The phthalocyanines have found interest in many fields:as photoconducting agents, electrochromic display device or other information storage systems,as catalysts for different chemical reactions or photocatalysts in ecological systems. Abstract . The definition of materials as "substances having properties which make them useful in machinery, structures, devices and products" clearly connects materials with function . In general, solid materials are classified in five categories, based on both their chemical composition and their physical properties: metals, ceramics, polymers, semiconductors, and composites . Composites consist of a combination of metals, ceramics, or polymers. They are designed to display new, unusual properties that are not found in any single material. Nanomaterials are single-phase or multiphase polycrystals with a typical crystal size of 1 to 100 nm in at least one dimension. In this review, some new aspects about the nanomaterial dimensions are discussed as follows (a) nanoparticles, (b) layered or lamellar structures, (c) filamentary structures, magnetic nanoparticles and (d) bulk nanostructured materials. Abstract. The photochemical degradation processes is generally based on oxidative reactions initiated by very reactive radicals, such as OH radicals. However, there are a number of refractory substances (nitro-phenols being one of them) that degrades very slowly under these conditions. The heterogeneous photocatalysts seems to be one of the most efficient way to destroy aquatic phenolic pollutants. In this paper was developed a new type of heterogeneous photocatalysts that destroy and detoxifies waste water streams containing up to 300 ppm of o-nitro-phenol pollutants. The photochemical degradation of o-nitro-phenol aqueous solution was studied in this paper using as photocatalysts : zinc (II) 2,9,16,23-tetrasulphophthalocyanine (ZnTSPc) supported on SiO2 and zinc (II) 2,9,16,23-tetracarboxyphthalocyanine (ZnTCPc) supported on hydrotalcite (HT) . Was analysed the influence of hydrogen peroxide and light on the kinetic and reaction mechanism of ONF photodegradation. Reactions are 4-10 times faster than those obtained using the same photocatalysts but in water solution. organic species, coordination compounds or organometallics can be incorporated in the interlayer region. The host-guest interaction usually causes changes in their chemical, catalytic, electronic and optical properties. The isolation of materials with interesting properties and making use of soft chemistry routes have given rise the possibility of industrial and technological applications of these compounds. In this paper, it has been using several synthetic approaches to intercalate porphyrins and phthalocyanines into inorganic materials as layered double hydroxides. Hydrotalcite (layered double hydroxide (HDL) has been studied in this paper for intercalation of two cationic porphyrins: tetramethylpyridylporphyrins (free base, TMPyP, and the cobalt complex, CoTMPyP) and four anionic phthalocyanines: zinc (II) 2,9,16,23-tetrasulphophthalocyanine (ZnTSPc) and zinc (II) 2,9,16,23-tetracarboxyphthalocyanine (ZnTCPc), cobalt(II) tetra(4-sulfonatophenyl)porphyrin (CoTSPP) and cobalt(II) tetrasulfophthalocyanine (CoTSPc). These macrocycles have been supported on the external surface of the LDH (CO2-3 occupies the interlayer region). For porphyrins, out-of-plane twisting by the 5,10,15,20-substituted phenyl rings, provides a route to construct structures extending beyond the macrocycle plane. The new systems were prepared by anion-exchange. The isolated materials have been characterized by IR and UV-Vis diffuse reflectance absorption spectra, X-ray diffraction, surface area measurements. Powder X-ray diffraction data, of the intercalated LDH show complete intercalation. Interlayer d-spacing increased from 18.5 A and 22.7 A. Could be suggested that the interlayer arrangement is determined by both the layer charge density of the host materials and the position of the anionic groups substituted on the guest molecules. The adsorption of zinc-complexes of 5,10,15,20 - p - sulphonato - phenyl - porphyrin (ZnTSPP) and 4,8,18,22 - tetra - sulphonato - phthalocyanine (ZnTSPc) on microcrystalline cellulose occurs after swelling the matrix with a polar protic solvent, by entrapment of the probes within the polymer chains, for low loadings, and in “pools” of microcrystals, for high loadings. The adsorbed compounds were characterised by ground-state diffuse reflectance technique (GSDR). These adsorbed complexes have also been studied as catalysts for o-nitrophenol photochemical degradation in aqueous solution. This paper deals with synthesis and physical-chemical characterisation (UV-Vis, IR spectroscopy, X-rays diffraction) of some cobalt complexes with ligands as cobalt-phthalocyanine (CoPc), cobalt-tetra-methyl-porphyrin (CoTMP) and cobalt tetra-phenylporphyrin (CoTPP) encapsulated into different mesoporous materials of types: Y, AlMCM-41, MCM-41, macronet polymeric resins MN 150. With diameters in the range 15 -30 A, the encapsulated cobalt complexes are improving their stability and get the ability to participate at oxidative processes due to the bridges M-O-M in cuboctaedrics of mesoporous materials. Abstract. The must obtain of a quick steels with manufactures prices how much the little maul, through the of a substitution basic addition agents loves with others the cheap maul, how was the main argument of researches presented this in work. The alloying drove to the of a obtaining steels with base of alloying W-mo or Mo, carry can be allied with Si, appearance put the obvious in the of a obtaining cementing outfit chip tools with properties in exploitation are approached to the one of quick steels knotweed. Abstract. Foamed concrete can be considered relatively homogeneous when compared to conventional concrete, as it does not contain coarse aggregate phase. However, the properties of foamed concrete depends on the microstructure, composition which are influenced by the type of binder used, methods of pre-foamation and curing. Though it has been widely recognised as an insulation material, a renewed interest is shown by researchers in its structural character exhibits. As the production involves the materials of low density: a few fillers viz fly ash, quarry dust, GGBS and sludge from paper mills. An attempt has been made in the present study to produce foamed concrete of desired density 1600 kg/m3 to 1800 kg/m3. Then their strength properties viz compressive strength, flexural strength and the resistance against sulphate attack were investigated and the results are reported. Abstract. The monitoring of systems/processes functionality in real time represents the safest way of maintaining them within the optimal parameters. Both fast mechanical processes, and slow ones, are monitored. The mechanical processing is decisively influenced by the wear of work elements. In the case of processing processes, the wear of the tool affects the size of the part, the quality of the processed surface (roughness), form deviations. Abstract: It is presents a method of kinematic analysis and synthesis of orientation mechanisms (wrist) with two and three output rotations. A classifying criterion is introduced and a unitary kinematic synthesis is used for the main mechanical schemes of orientation mechanisms with two and three independent motions (d.o.f.). For the sake of a unitary kinematic method 3 criteria are considered, which correspond to the orientation mechanism with bevel gearings. In the case of direct kinematics, the movement is computed in two or three sequences and the kinematic chains, specific for each mobility degree, are identified. The reverse kinematics is associated with the kinematic synthesis of the orientation mechanisms. This implies the calculus of the input parameters when the two or three angular output displacements are imposed. A new kinematic schema together with design schema of orientation mechanisms with decoupled movement is presented. Abstract.This paper’s aim is to study the new type of medical robots, as well as to design, make and implement an original model of intelligent orthosis mean for neuromotor rehabilitation. By the reason of complexity theme approached, we consider that the research activities are very varied and they involve knowledge about biomechanics, mechatronics and robotics, analyses, numerical shaping and simulation, assisted design and many also, therefore this paper may be considered a pluridisciplinary work. Abstract. This paper’s aim is to study the new type of orthoses, as well as to design, make and implement an original model of intelligent orthosis mean for neuromotor rehabilitation. By the reason of complexity theme approached, we consider that the research activities are very varied and they involve knowledge about biomechanics, mechatronics and robotics, analyses, numerical shaping and simulation, assisted design and many also, therefore this paper may be considered a pluridisciplinary work. Abstract. In this paper the modality of determination of the filing rate of the brake dram of the mill having milling objects is presented. In accordance with this magnitude, others magnitudes specifically of the working of the cannular mills with balls: the loading weight, the supplement loading(which compensates the wear of the milling objects), the static moment of the loading are presented too. For realize the purpose of the paper, mathematical expressions and adequate graphical representations are utilized. Abstract. Further the study about some characteristic magnitudes of the working of the cannular mills with balls, in this part, the necessary power to the action of the brake drum of the mill, the inertia moment of the milling loading are taken into discussion. About the starting of these equipments some mentions are made, too. The paper finishes with an example of illustrative calculus. Abstract: At the elastic stable equilibrium of compressed beams, if the axial compressive force increases the total potential energy increases DP > 0, in other words the variation of elastic deformation potential energy is larger that the work done by exterior forces. In the case of unstable equilibrium, the total potential energy decreases DP < 0, so the variation of elastic deformation potential energy is smaller that the work done by exterior forces. 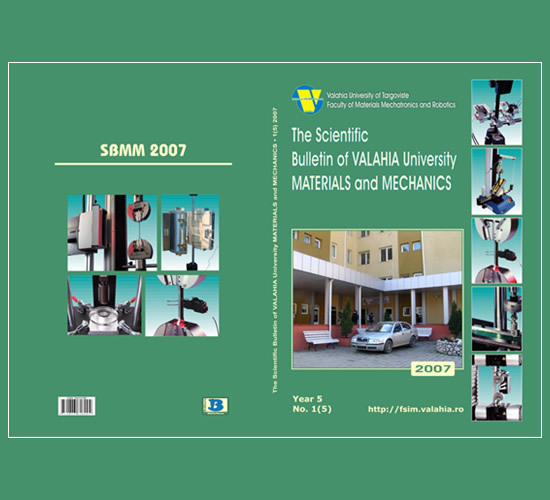 This article conducts the computations of displacements for a beam subjected to compression and bending. The displacements are determined as function of axial force of compression and the results are obtained by two different methods. Abstract. The dynamical stresses occur in case of shock loading and they are very important for the manufacturers due to the fact that they can reach significant values which can be higher than the allowable stresses of the material. These stresses depend on the shock’s intensity (the maximum or the average value of the dynamic force), impulse duration and last but not least, on the dynamic rigidity and mass characteristics of the mechanical system. This article presents the dynamic coefficient variation with the relative impulse variation t1/T, under the conditions of a rectangular impulse shock loading (T is the eigenperiod of vibrations of the elastic system). Abstract. Starting with cutting function and moments expression, which is applied very often in most of the specialty books and having in view a lot of mathematical procedures we established the forces and the moments - Fx, Fy, Fz, Mx, My si Mz -using cutting regime parameters of 4 types of heat resistance steels. On the base of mathematical relations established above and using MathCad application, we have generated cutting forces and moments expressions curves, varying cutting regime parameters during drilling processing. During of the experimentation it will used the next splinting tools: helicoidally borers f 8, f 10 şi f 12, f 16 and f 20 with 2k = 140° made from Rp5 steel with HRC 62. The results of our theme are the presentation, of some diagrams useful in cutting process optimization. Abstract. In order to achieve the work we have processed flat samples, CT model, with side cut, made of stainless steel mark 10TiNiCr175. They have been challenged at fatigue through eccentric traction, with the asymmetry coefficients R=0.1, R=0.3 and R=0.5. The test temperature was T=213K (-60ºC). During the experimentations we noted the ai crack’s length variation and the numbers of corresponding cycles Ni. According to the studies made in the field, through numerical calculus we have determined the stress intensity factor ΔK on top of the crack, the stresses on the front of the crack σx and σy and the σc stress, considering the phenomenon as a challenge composed by the traction with bending. For the three asymmetry coefficients we have drawn curbs of the shape σ(a), σ(N), σ(ΔK). Abstract. The paper proposes a study for the propagation rate of the crack through the standard polynomial method and through the secant method, respectively for the σ stress on top of the crack in a material challenged during fatigue through eccentric traction. The analyzed material was a stainless steel of the V2A class, mark 10TiNiCr175, and the challenge was performed with the asymmetry coefficient R=0.5. The CT type samples were tested at three temperatures: T=293K, T=253K and T=213K. We noted the variation of the ai crack’s length and the numbers of cycles Ni. With these primary parameters we have calculated the cracking rate da/dN, the stress intensity factor ΔK and the stress σ. We made the graphical representations of the rate da/dN and the stress σ in report to the crack’s length a, the numbers of cycles N and the factor ΔK.